In The Ohio River Valley, Voters Aren't Sure Either Candidate Can Help : It's All Politics Neither President Obama nor Mitt Romney seems to be winning the hearts of blue-collar voters in this part of the state. Economically, says one analyst, many residents here should be voting Democratic; but their social conservatism clouds the picture. 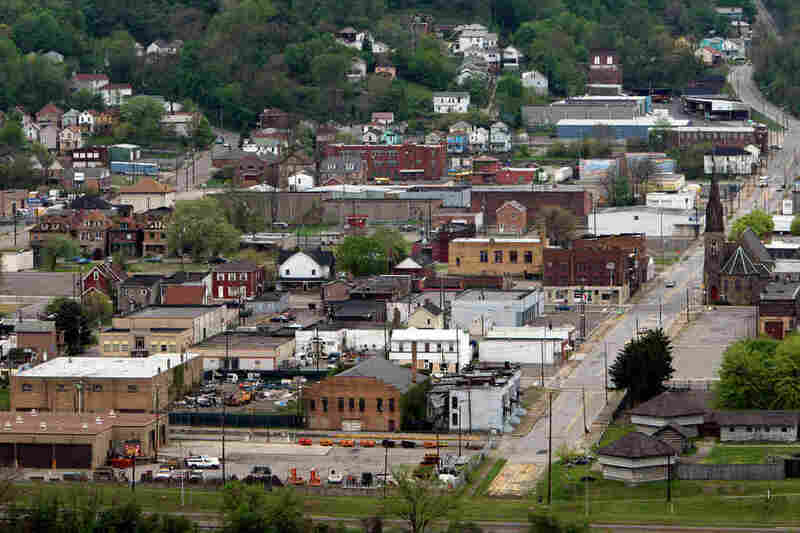 Towns near the Ohio River, including Steubenville, seen here in 2009, are home to many undecided voters. One of them, Brian Snider, says, "This is pretty much a ghost town." Most of the election-year attention Ohio gets is focused on the heavily Democratic areas in the northeast around Cleveland, or in GOP strongholds in rural areas and in the south around Cincinnati. But it's also worth keeping a close eye on the state's less-traveled southeastern border with Pennsylvania and West Virginia — the Ohio River Valley. It's a place where there is a lot of doubt about how much either candidate can help. Drive south on Route 7 in Jefferson County, and the Ohio River is to your left, winding along the Appalachian foothills near hulking, silent steel mills, and past towns with names like Steubenville and Mingo Junction. That's where I bumped into 44-year-old Brian Snider. "This is pretty much a ghost town here now," says Snider. "I grew up around here. I mean, there's only the one little store there. There used to be dry cleaners, car washes ... They're all gone." The county jobless rate still tops 10 percent. Snider does have a job — as a warehouse manager making $11 an hour. Talking politics seems to make people weary here. You can hear it when I ask who he voted for last time. "It wasn't Obama," he laughs. But Snider says this year he's not sold on Mitt Romney, either. "Who do I vote for?" he asks. "I don't know, 'cause they both say they're gonna take care of us." But Snider says he doesn't see either helping much. Nearby in the town of Brilliant, Edith and Joseph Fetty live in a ranch-style house with American flag pinwheels out front. He's retired military, and later worked for the school district. She has worked a variety of jobs. The economy is the big issue for them. I asked how things are going. "Not good since the mills closed down," she says. They both voted for President Obama last time, but this year they both say they haven't made up their mind — they are Democrats who are disappointed in the job the president has done. That's good news for Mitt Romney, right? Maybe not. "What is the stopper with him for me is wanting to privatize everything," says Edith. "The Republicans want to privatize, and I'm not for that." David Cohen, a political scientist at the University of Akron, says voters like these explain how someone can still be undecided in a contest between two such very different candidates. "This is a population that, if you look economically, they should be voting Democrat," he says. But he adds that people in this part of the state are also often very religious, social conservatives. Additionally, he says, President Obama's race seems to be a factor with at least a portion of these voters. "But you also have to remember that Mitt Romney is a Mormon, and especially among evangelicals, that makes them uncomfortable," he says, "so they don't have a natural fit on the Republican side, either." Obama did win Jefferson County in 2008 — but just barely. His margin was far smaller than Democratic nominee John Kerry four years earlier, even though Obama won Ohio, and Kerry did not. Voters here are reluctant to talk about race. John Buchmelter, a 75-year-old retired steel worker in Mingo Junction, is an Obama supporter. He says he doesn't want to think Obama's troubles here are because of his color. "I don't want to believe that," he says. "I voted for him last time, and I'll vote for him this time." Just to the north, in the Ohio town called Toronto, Romney supporter and former Herman Cain backer Byron Carlson, 37, says it's not about the president's race; it's about his policies. "Basically," he says, "to me he doesn't represent what America is, truthfully." He says the president represents an entitlement society. "People can't get something for free," Carlson says. "You gotta work for something." Ultimately, the talk here does turn back to the economy. There's hope that hydraulic fracking may bring jobs. And there are worries that the president will press environmental regulations that will stifle that practice. But Romney is hardly winning blue-collar hearts — which means the undecided have less than eight weeks to figure things out.